The federal government recently announced Zero Emission Vehicle (ZEV) purchase incentives and funding for charging and fueling infrastructure. ZEVs are plug-in hybrid, battery electric and fuel cell vehicles, and the funding supports new national sales targets of 10% by 2025, 30% by 2030 and 100% by 2040. The recent announcement feels like a tipping point in Canada when it comes to electric vehicles. BC, Quebec, and, until recently, Ontario, have been active in accelerating the adoption of EVs. A growing number of cities across the country have also been developing and implementing strategies to support EV deployment. At the same time, auto manufacturers are coming out with more vehicle models and costs are dropping. These developments are going to transform the vehicle landscape in Canada, potentially phasing out gasoline and diesel for cars over the next 30 years. According to FleetCarma, about 46,000 EVs were sold in Canada between 2013 and 2017. If we assume two million passenger vehicles are sold per year (the 2017 Canadian sales number), we can expect almost 10 times as many EVs on the road by 2025 – and almost 35 times as many by 2030. That’s a big change over a relatively short period of time! Growing EV adoption is going to have many different impacts, but let’s consider one we don’t hear about very often and that will affect many of our businesses: the impact on parking lots. Parking lots and spots are poised to become the new gas stations. If you own or operate a parking lot, whether it’s for rental units, condos, your business, or an industrial facility, increased EV adoption will create new demands from your lot users. 1. Determine if installing charging equipment is or will be a government requirement. 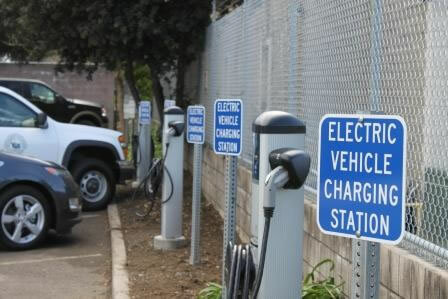 Due to provincial and municipal requirements, many new parking lot builds in urban centres are required to equip a portion of parking spots with charging equipment and/or ensure the spots are ‘charger ready’. Existing multi-unit residential buildings (e.g., high-rise rentals and condos) can expect increasing pressure from tenants and owners for access to chargers. In some cases, such as in Ontario’s ‘right to charge’ regulation for condos, governments may step in and create requirements for how resident requests for charger access must be handled. 2. Consider the advantages of installing charging equipment. Lots that service residential, commercial rental and hotel properties may find that a growing number of residents, tenants and guests are making charging availability a selection criterion. From a retail perspective, some sites look at charging equipment as an amenity as it may encourage customers to stay on-site longer. 3. Consider the benefits to your employees. Workplaces across the country are receiving an increasing number of requests from their employees to install charging equipment. Given that workplaces are where cars sit unused for the second longest periods of time (after home), workplace charging can be a significant enabler for EV adoption. In the case of plug-in hybrids (cars with a typical electric range of 20-90km that can also use gas), chargers are also a means of minimizing gas use and maximizing the environmental benefits of EVs – which can be a win-win for EV owners in terms of cost savings and lot owners in terms of helping companies deliver on corporate sustainability strategies. 4. Identify technical limitations and plan ahead. Electrical capacity may be an issue for some sites, and/or the cost of installation work may be significant depending on the distance between electricity supply and parking spots. As the rate of EV ownership will only rise, when installing initial charging units, it may make financial sense to also increase capacity for future chargers. Some lot owners may want to consider a number of smart-charging technologies that can charge groups of vehicles to minimize electrical load. 5. Determine the level of consistency across multiple lots. If you have multiple lots – e.g., you are a company with multiple employee lots at different sites, or you are a property company with multiple assets – you’ll need to think about how consistent you want to be. For example, will all sites have the same payment scheme and level of access to charging equipment? Will individual sites be allowed to choose the type of charging equipment and number of chargers for their respective lots, or will there be a central set of requirements laying out what each of the sites should do? These are just a few of the considerations that point to the need for parking lot owners to adopt an overarching strategy on ZEV infrastructure. The strategy doesn’t need to be overly complicated, but a moderate amount of careful thinking now – while demand is lower than it will be in the future – could help you avoid challenges in the next five to ten years. Stay tuned later in the spring for the release of a report on barriers and solutions to ZEV charging in multi-unit residential buildings and for garage-orphans, as well as a strategy framework for ZEVs in municipalities. You can also check out our work on the Atlantic and Prairie Provinces here.